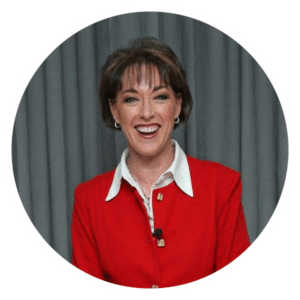 If you have kids from 6 – 10 years of age, then you need to be upping the ante if you want to compete with the fun and excitement they can find on a screen/device and commit to making family time and playtime special. Interestingly, children in this age group are actually seeking sensory stimulation to balance screen time. You can see this from the popularity of squishies, bubbleezz and slimibalzz this year which have been trending. Use construction toys, creative activities, board games, brain games and tech toys to stimulate your child’s creativity, critical thinking, problem solving and reasoning skills. At this age your children can start to compete with you and if you play with them often enough you will also be able to observe some of their innate talents and skills starting to surface. Sometimes these are not what will appear on their report card from school, making playing with your child a real investment in your parenting experience. 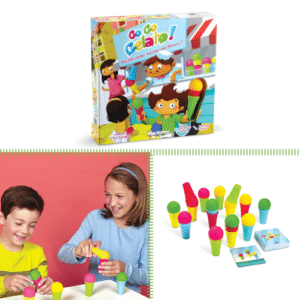 Race to match the challenge cards by balancing the gelato balls on the ice cream cones but, you cannot use your hands! Four ice cream cones for each player with three different coloured balls. Manoeuvre scoops into the correct cones to match the cards. First player to win five cards wins the game. And, if you drop a ball in your haste to win, you have to pick it up with the ice cream cones – no hands! PlayMais can be reshaped, squeezed, cut and moulded into any shape. By moistening the pieces with a little bit of water they will stick to each other and many different surfaces. Made from corn starch, water and food colouring they are 100% biodegradable and safe (even if eaten!). 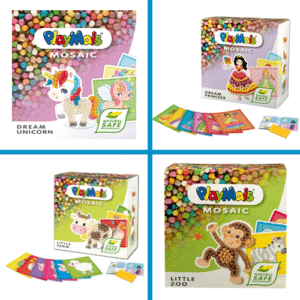 In these kits there are six pre-printed picture cards and 2 300+ PlayMais mosaics, a sponge and easy to follow instructions. Helps to develop fine motor skills and creativity. Easy and fun to play. A co-operative game of cat and mouse. The cats work together to catch the mouse and win the game. They must surround the mouse on all four sides before it gets to the fence to escape. 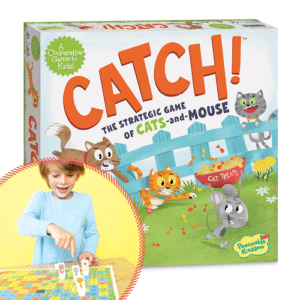 Each player’s move consists of three steps: roll the dice, move the mouse, move the cats. One dice moves the cats and one moves the mouse. This game requires strategy, cunning and team work to win. Playstix is a Rolls Royce construction toy that is not made up of blocks but of sticks! The Playstix Master Set consists of 141 pieces including 20 new detailed, molded pieces such as an engine, bumpers, wings, racing seat, real rubber tyres and tracks (for bulldozers or tanks), abulldozer bucket, revolving steering wheel and propeller, radar unit, and laser gun. These additional pieces extend the kind of models that can be created with Playstix. 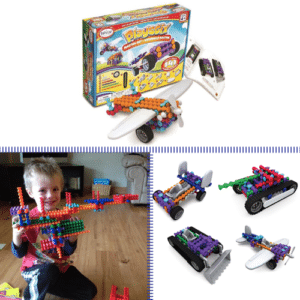 Follow the instructions in the booklet or use Playstix for imaginative free play. 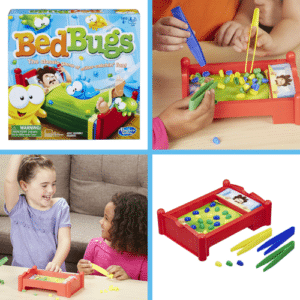 Have some hysterical family fun as you race to be the first player to use the tweezers to grab all your matching coloured bugs off the very bouncy, vibrating bed. It’s more difficult than you think! Each round you win, you score a point. The first person to get five points wins the game. Excellent for exercising fine motor control and eye-hand co-ordination. Stimulates all the right muscles for the pincer/tripod grip for handwriting. For younger children, switch off the bed and it will be much easier for them to master the skill. Once they are proficient enough, switch the bed on but we suggest you start with fewer bugs or change the rules to be the first player to catch 5 bugs, not all of them. It’s also easier to play with two players instead of three. Just some ideas to make this game applicable to a wider age group. 50% logic. 50% construction. 100% awesome and educational. 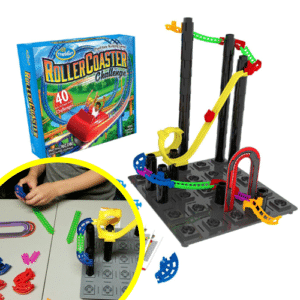 This 3D brain game is a fun STEM toy which involves building roller coasters using 36 posts and 39 tracks to complete the 40 graded challenge cards (from beginner to expert) that come with solutions. Race the roller coaster car down the track to see if you’ve succeeded. Younger children can copy the solution cards and older children can solve the puzzles. Spatial planning, thinking, reasoning, problem solving in abundance in this 2 in 1 construction and brain game. Become a Putty Peeps mixologist and create new original colours. Use your hands to mix and stretch the colours together. Add a special effect to make your colour glow, glitter or shine. Add Googly eyes that are included in the lab kit to give your new Putty Peeps a personality. The kit includes super storage containers to keep your putty colours in so you can use them over and over again. 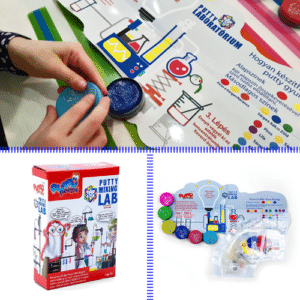 The lab kit includes: bulk white putty, 3 super concentrated putty colours (red, yellow, blue), three super concentrated special effects putties, 6 storage containers, four pairs of eyes and a putty mixing play mat with instructions. Your child will learn about colour while experiencing all the benefits, including relaxation, of playing with such a sensory toy. A high tension sophisticated snakes and ladders-type board game. 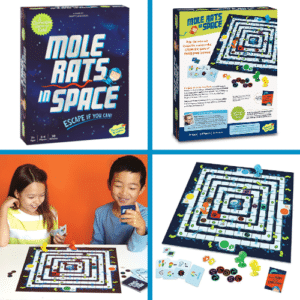 Take your mole rats up the ladders and down the air shafts. A co-operative game in which players work together to collect all four essential pieces of equipment and make it to the escape pod before the snakes get them. One bite from a snake and you get to use your first aid kit. Two bites and the game ends. So, avoid the snakes! Children learn strategic thinking, problem solving, communication and co-operation. There are game variations for a more challenging version of the game. Transform this supercool crate into a stunt track, then fold it up again for easy storage and portability. Play on your own or with up to four friends. Build three massive stunts by changing the configuration of the track including the Gravity Drop, Mega Jump and Drag Race. Kids can race, stunt and challenge friends. 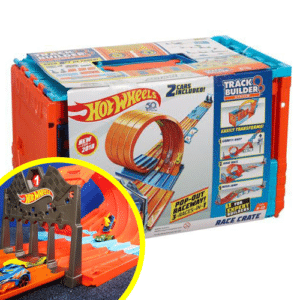 The crate comes with two Hot Wheels cars and 8ft of track, a two-lane loop, finish gate and two double-slam launchers. It interconnects with other Hot Wheels sets. A mini drone no wider than the palm of your hand – quick, nippy and easy to fly and charge. It’s highly responsive and very stable due to flight assist technology with auto launch, auto hover and auto land. Endless hours of indoor fun. 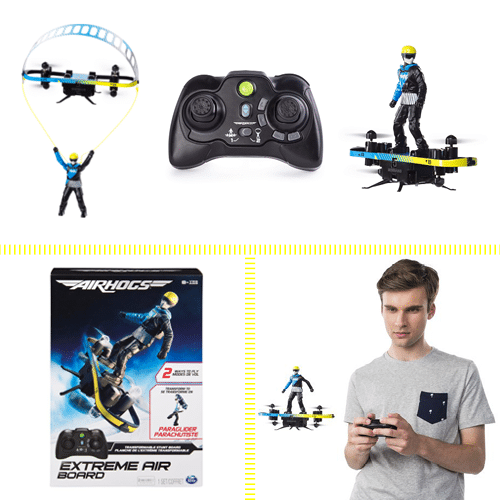 It’s a 2 in 1 toy: a remote control stunt board and para-glider that is able to do extreme sports stunts (with practise, of course!). Push the stunt button on the RC to pull off 720 degree spins, 360 degree barrel rolls and backside flips in stunt board mode. Attach the para-glider accessory to take on side-winders, cyclones and evaders. We have had such fun with this little guy!